Soar to new levels of quadcopter sophistication when you fly the DJI Inspire 2. 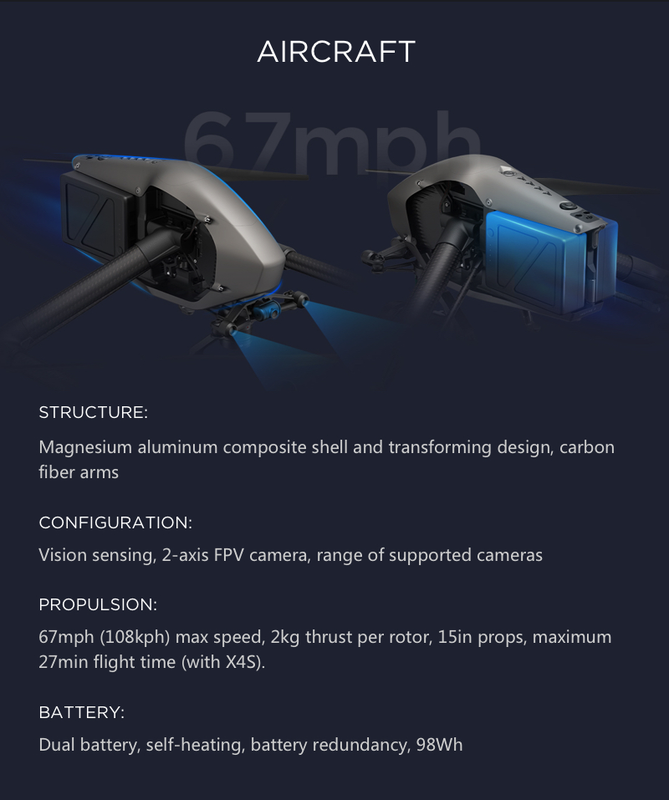 This drone is fast, highly maneuverable, precise, and more powerful than its predecessors. The Inspire 2 gains strength from a high-quality magnesium-aluminum body and carbon fiber arms. These materials are not only durable but also attractive, with a totally modern high-tech aesthetic. 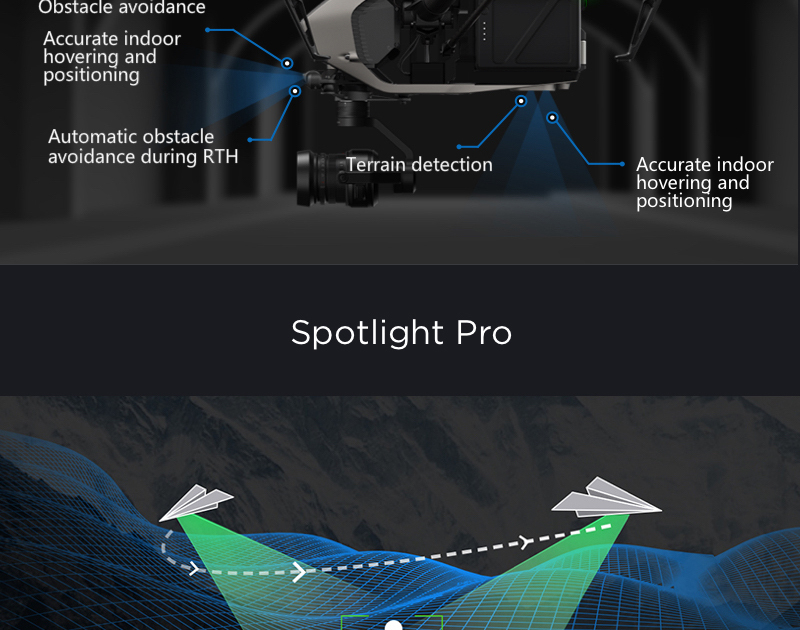 The Inspire 2 flying platform becomes an extremely capable flying camera when you equip it with the compatible camera that works best for your particular needs. Professional-grade aerial video and aerial photography are at your command. Depending on your choice, you’ll be able to shoot 5.2K cinematic-quality video or 4K video, and highly detailed 20.8MP stills. And with optional licensing from DJI, available through Commercial Drones, you’ll get the most from your video with editing through DNG RAW or Apple ProRes. DJI doesn’t build its drones to fail, but if a sensor does go south, your job will continue to completion — successfully. Inspire 2 benefits from both GPS and GLONASS, so if one system becomes unavailable, the other should see you through. There are redundant compasses and IMUs, and dual sensors forward, overhead and below. If a battery fails, Inspire 2 returns home safely on the other battery. It will accurately return to its shooting position after you swap out fresh batteries — and you can hot swap, which saves time. 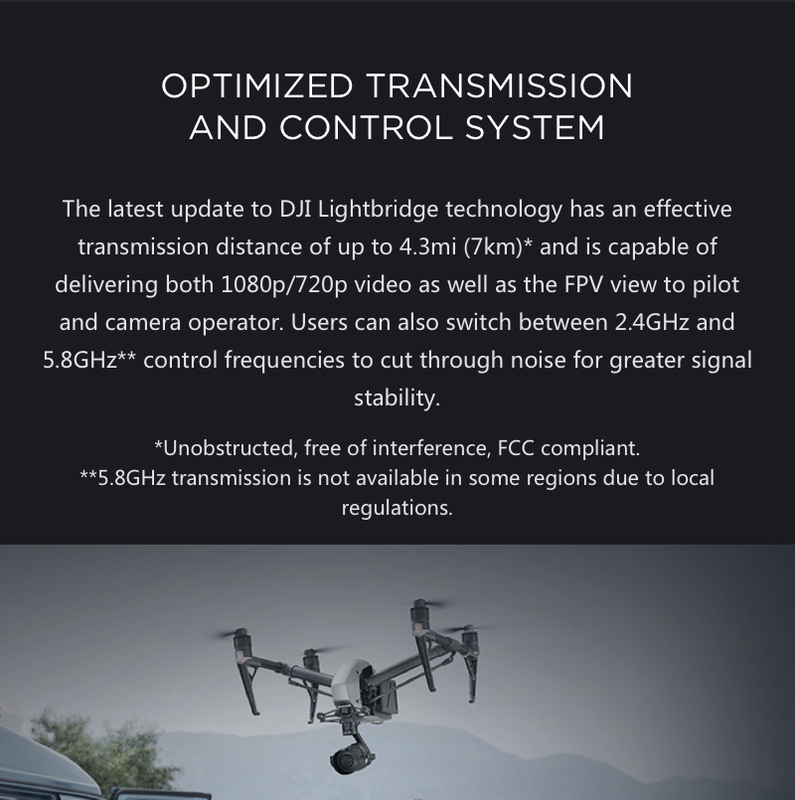 Video transmission is through DJI’s Lightbridge program. It has a range of 4.3 miles. And it has two frequencies — 2.4Ghz and 5.8Ghz. If the Inspire 2 detects interference on one frequency, it automatically switches to the other. That keeps your streamed video constant and sharp. You work to make sure nothing gets in the way of your career, or of an important assignment, so it’s only appropriate that nothings gets in the way of your Inspire 2, either. Inspire 2 can sense obstacles a far away as 94 feet, even when it flies as fast as 34 mph. It will sense and avoid obstacles whether you are at the controls, you use Tap Fly, or Return to Home is activated. Flying indoors? Sensors detect overhead objects as a far away as 16 feet, and objects in front as close as 2 feet. 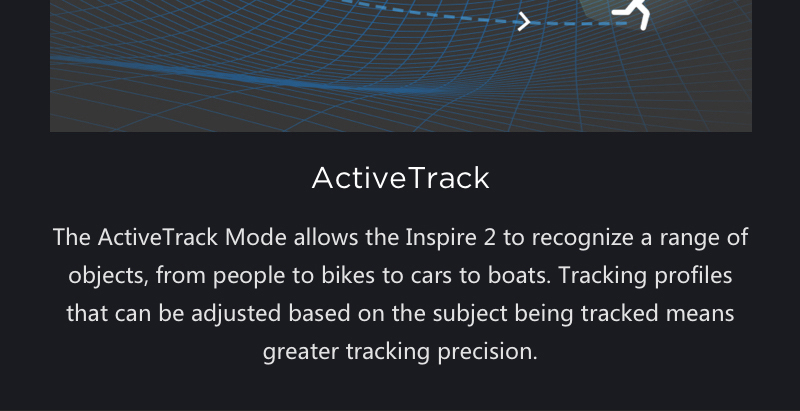 With ActiveTrack, the Inspire can recognize and follow its subject. But what if the subject is walking uneven terrain — along a trail, or up and down stairs? Inspire 2’s bottom sensors help it recognize changes in terrain. It will follow along just as it’s supposed to, maintaining a uniform height off the ground. Four 15-inch propellers — the huge props generate gobs of thrust — can accelerate the Inspire 2 from 0 to 50 mph in just 4 seconds. Your equipment van won’t come close. Filming a chase scene? The crooks will outrun the cops before they escape the Inspire 2, which can hit 67 mph and maneuver to follow their every turn. After all, it will lock onto them. Want to get that elevated shot fast? Inspire 2 can climb at 19.7 feet per second. Go ahead and yell “Close up!” Inspire 2 can descend at a breath-taking 29 feet per second. You won’t miss a single, valuable high-def frame of action. Return to Home is engineered to get your drone back safely to you if a signal is lost or power becomes unacceptably low. Return to Home is smart. Return to Home is safe. Return to Home is insurance on your investment. Here’s how it works: The Inspire 2 creates a real-time map of the route you direct it to take. That’s part of what the vision sensors do. 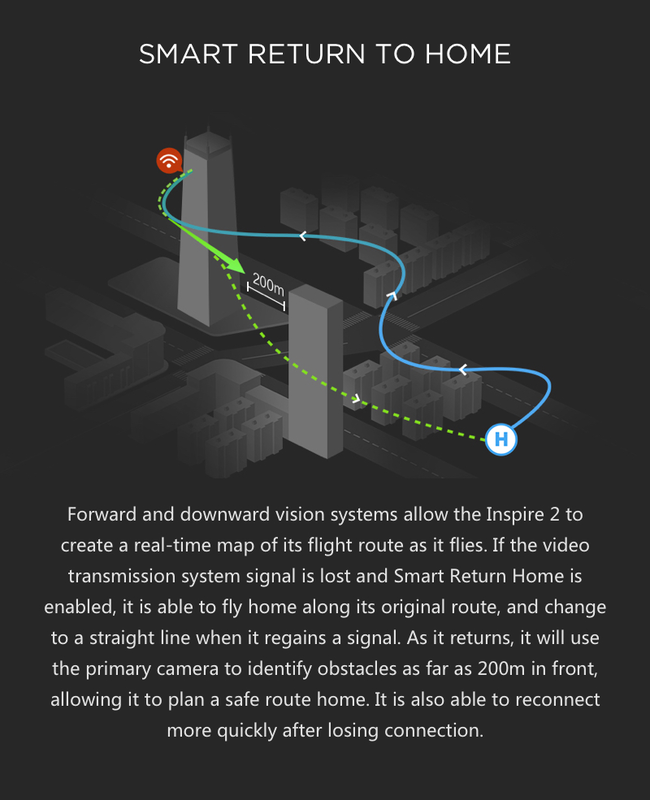 If Return to Home is activated automatically, the Inspire 2 goes to its memory of the route — the safe, obstacle-free route it just took — and follows it home. If the signal is restored, the Inspire 2 flies home on a straight line, automatically avoiding obstacles in its path. For a TV crew using an Inspire 2, transmitting images live for a real-time television broadcast is quite simple. The 1080i50 or 780p60 video streamed from the Inspire 2 can go straight into living rooms. 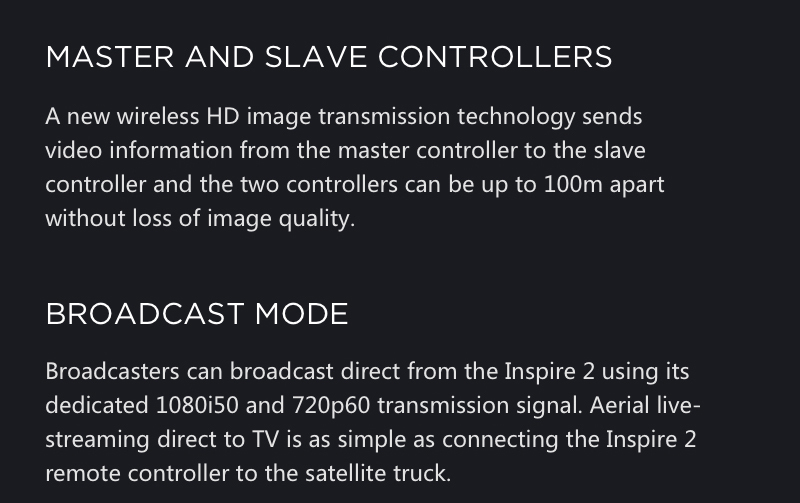 Just connect the Inspire 2 remote controller to the satellite truck. With a satellite link, the signal can be sent instantly anywhere in the world. With TapFly, you can touch an area of the FPV screen and the Inspire 2 will follow the route you designate. That frees the pilot’s hands from commanding the drone. It lets the pilot concentrate on aerial imaging. 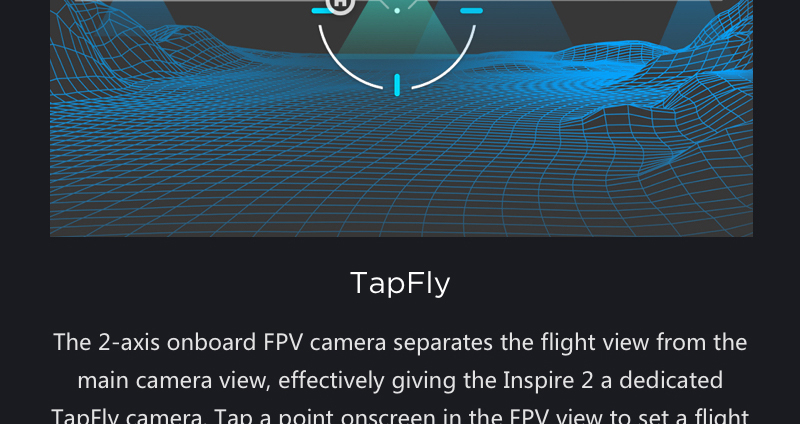 TapFly lets you pay attention to gimbal movement, not the flight route. 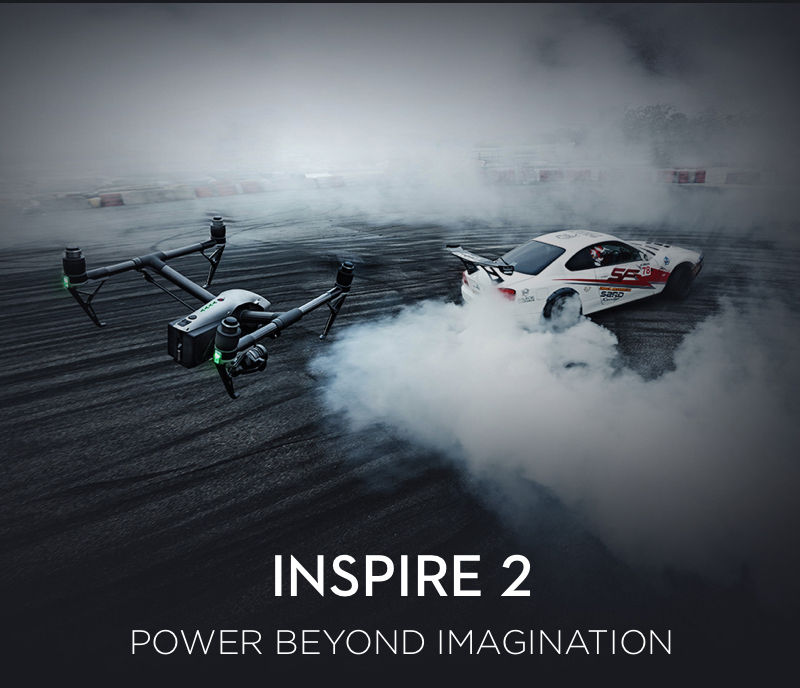 The Inspire 2 produces quality video and stills with either of two cameras available through DroneNeds.com. Both are stabilized by DJI’s motorized, nearly silent 3-axis gimbal. 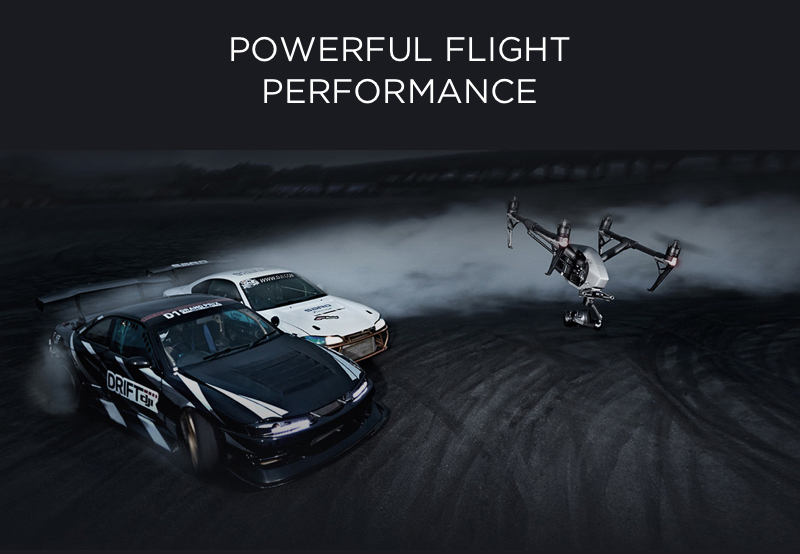 Their performance is elevated by a DJI CineCore processor, which is built into the Inspire 2 itself. The X4S has a DJI fixed lens with rapid autofocus. 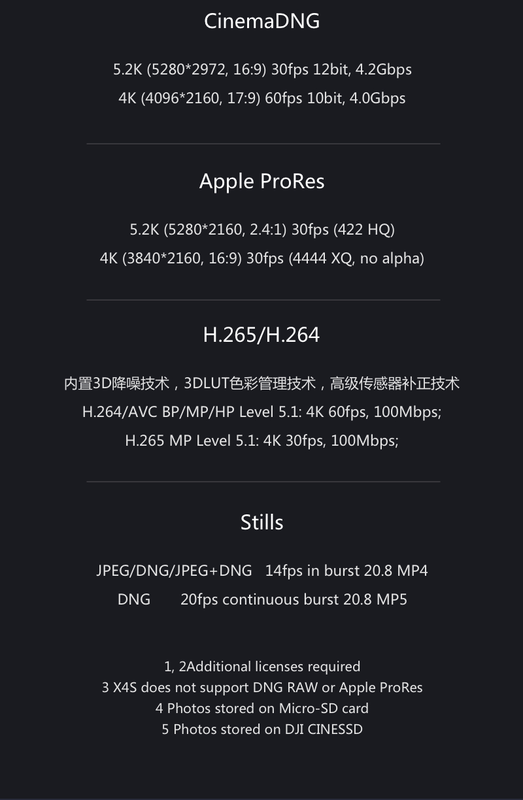 It shoots 4K video at 60fps, which also allows quality slow motion, and H.264 and H.265 at 100Mbs. The stunning 20.8MP stills are distortion-free because the X4S has a leaf shutter, which prevents rolling distortion on even the fastest action— action by your subject or by your drone. Shoot stills in either DNG or JPEG formats, in rapid 14fps bursts. The DJI X5S camera is even more capable. It accepts interchangeable lenses, ranging from a wide angle 18 mm equivalent in 35mm format, to a 90 mm equivalent telephoto lens for tighter shots. 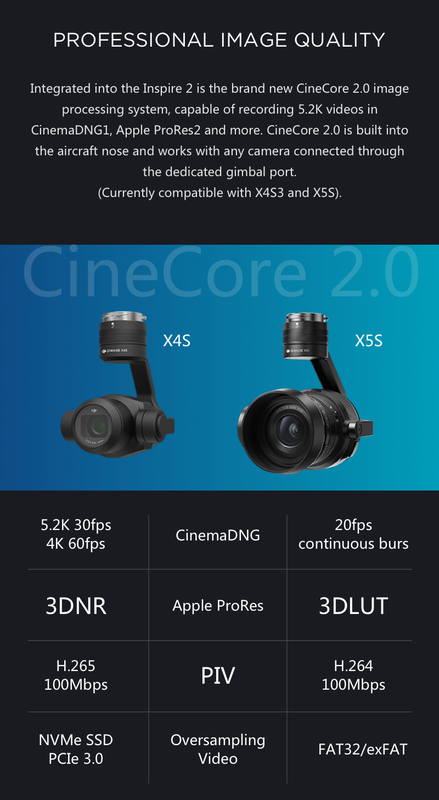 CineCore 2 processing, which is built into the Inspire 2 body, allows the X5S to shoot cinematic-quality 5.2K video at 30fps. It shoots 4K video at 60fps. Stills are recorded at 20.8MP, and they are shot in mind-boggling 20 fps bursts. Although the gimbal and camera can be removed from the Inspire 2, no Osmo Handheld System for the X5S camera is yet available. It’s coming, however, so stay tuned. Until that time, you can handhold the Inspire 2 for ground video, relying on its gimbal to smooth your hand and body movements from the video. The Inspire 2 weighs about 7.6 pounds. ActiveTrack lets you lock onto your subject, but shooting modes in the Inspire 2 let you get sophisticated video and stills even if you don’t have a dedicated camera operator. Quick Mode locks onto and begins following the subject immediately. Composition Mode memorizes the subject, then begins tracking the subject when it enters a certain area, needing only your command. 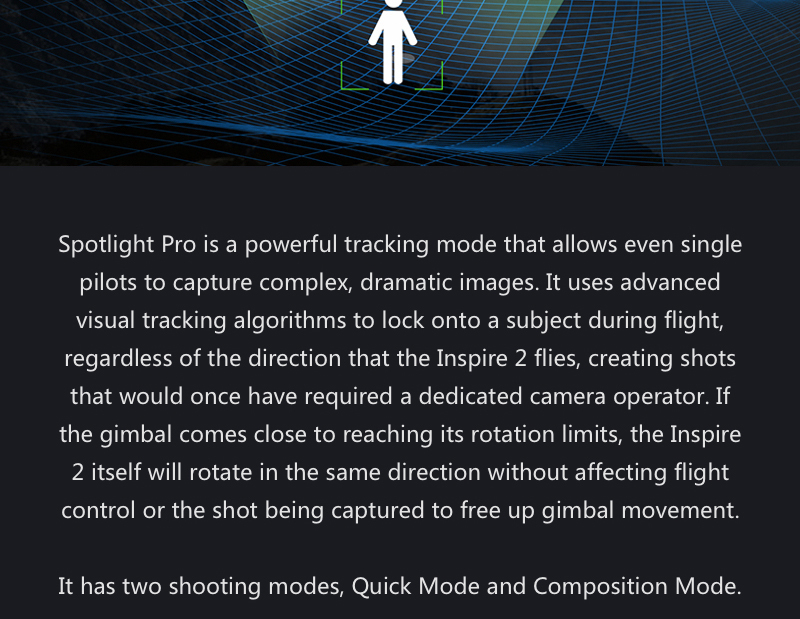 The gimbal settings can be changed for creative shots. Point of Interest lets you lock on a subject and circle it, recording as you go. With Waypoints, you can fly a route and mark certain spots, and the drone will automatically fly the route, stop where you told it to, and record, then hover or return home — your choice. Spotlight keeps an object in the frame as you maneuver your Inspire 2 for creative angles. Climb, dive, circle, hover — with Spotlight, your subject remains in your images. Control does take a leap higher with a second remote controller. Operating remote controllers in a master-slave arrangement, the pilot flies off the video streamed from the built-in FPV camera, while the camera operator sees what the video camera sees. The videographer controls the camera, concentrating on aerial imaging. The two controllers can be as far apart as 328 feet. Multiple slaves can be linked. We know you need to add a camera to your Inspire 2, so we bundle the Inspire 2 with two different cameras, one of which will suit your needs. One has a fixed lens, and the other accepts interchangeable lenses. Both are mounted on a stabilizing motorized 3-axis gimbal. Bundles save you money while adding convenience and delivering the level of performance you need. Inspire 2 Bundle with X4S Camera: 4K video, 20.8MPstills, fixed DJI lens. Inspire 2 Bundle with X5S Camera: 5.2K or 4K video, 20.8MP stills, interchangeable lenses. One lens is included. Inspire 2 Bundle with X5S camera, and licenses for Cinema DNG RAW and Apple ProRes. Inspire 2 Bundle with Cendence Remote, 7.85-inch CrystalSky Monitor, Zenmuse X4S camera, charger, 2 TB50 Intelligent Flight Batteries. If you’re not sure which bundle would work best for you, we’ll help. Just talk to a certified DJI expert from Commercial Drones about the work you. We’ll help you avoid buying too little performance to get the job done and buying more capability than you really need. After all, we understand the importance of budgets. 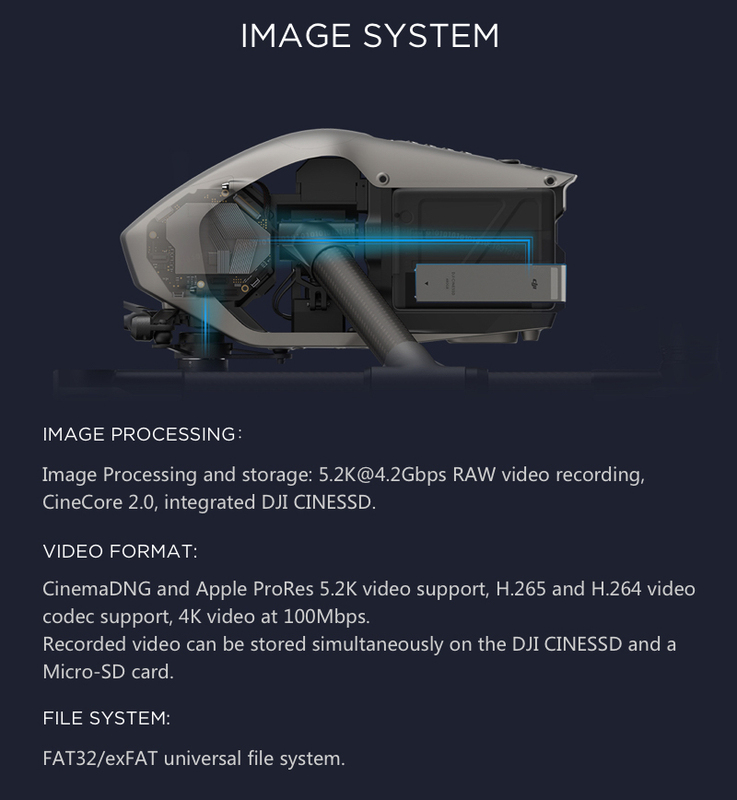 DJI CineSSD. This is the card for digital filmmakers. It records your 5.2K and 4Kvideo. Available are 120GB, 240GB and 480GB capacities. On the 240 and 480 cards, write speeds reach 4.2Gbps — the kind of rate filmmakers need for detail-rich data. Coming soon on this NVMe device: four PCI Express ports. DJI CineSSD Station. 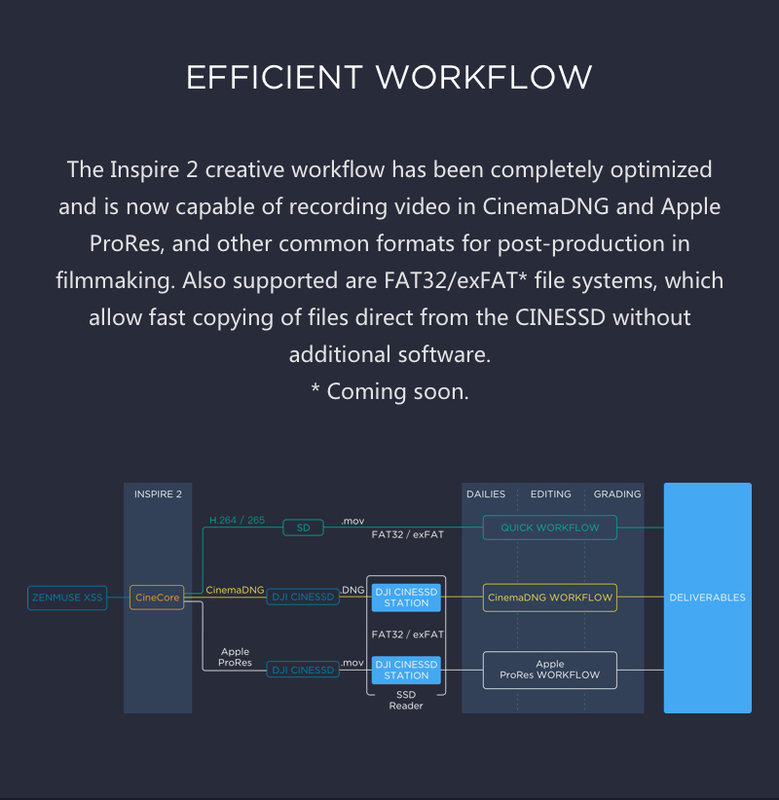 For fast file transfers from your Inspire 2’s CineSSD media, connect this station to your computer. Activation keys for DNG RAW and Apple ProRes. Buy them together or separately through Commercial Drones. If you have advanced post-production requirements, for feature films, documentaries, commercials or high-quality web pages, you need the editing capabilities these programs deliver. CrystalSky Monitors. If you struggle to see video images and data displayed on a smartphone or tablet in bright sunlight, these monitors overcome the problem. Available are a bright 5.5-inch and 7.58-inch monitor, and 7.58-inch monitor with twice the luminescence of those models. DJI Focus. This remote focus ring works on the X4S and X5S. It operates wirelessly from 328 feet away with a latency of a mere 14ms. Battery Charging Station. With a need for two batteries per flight, and flights in the mid 20-minute range, the Inspire 2 spends more time in the air with this accessory. It charges up to eight Intelligent Flight Batteries. 4G-LTE Network Connection. 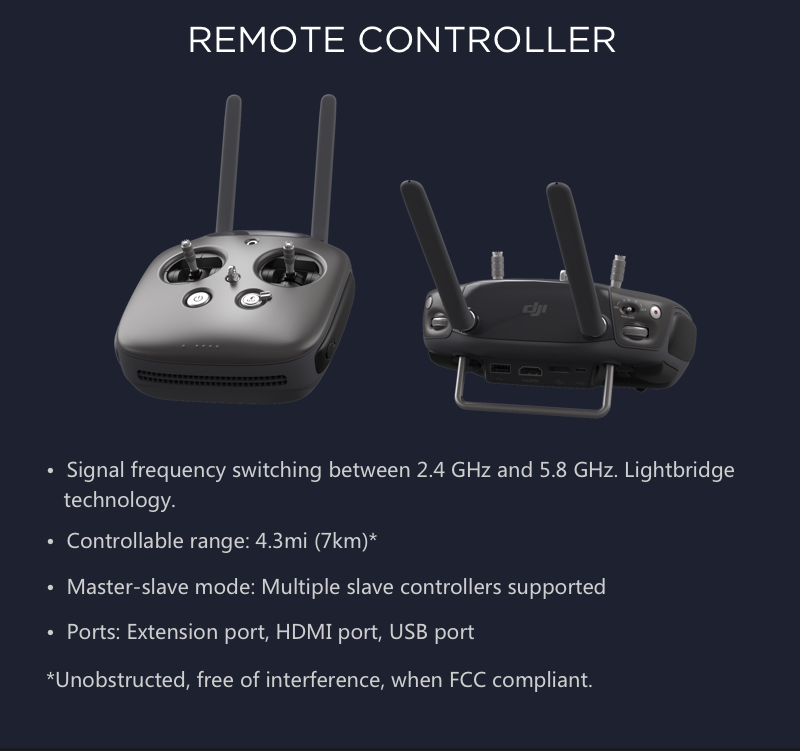 Fly your Inspire 2 over a 4G-LTE connection. Use it to transmit high-quality video to a server or for control over long distances. Transmission latency is just 500ms. Remote Controller GPS Accessory. Automatically update your location as you move while flying your Inspire 2, allowing it to return home to your latest location. 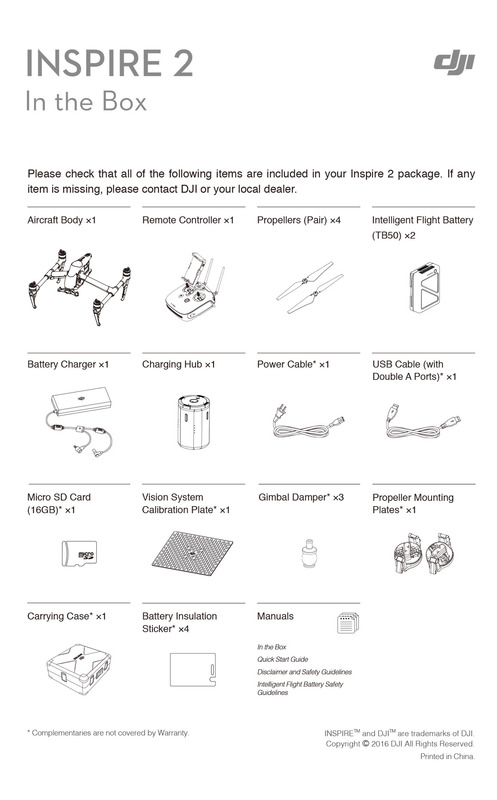 Is the Inspire 2 Ready-To-Fly? Yes, with only non-soldered connections needed. They take minutes. Can I fly in cold weather? The self-heating batteries and insulation stickers make flight possible down to minus-4 degrees F.
Does the Inspire 2 come with a camera? It has only a 2-axis FPV camera for streaming to the pilot. A choice of quality video/still cameras and gimbals is available trough Commercial Drones. You can also choose from two camera-equipped Inspire 2 Bundles. Can the Inspire 2 record 4K video? Both cameras available for the Inspire 2, the X4S and X5S, can record 4K. Can the Inspire 2 record 5.2K video? Yes, if equipped with an X5S camera and with optional equipment. You’ll need a compatible CINESSD card for storage. 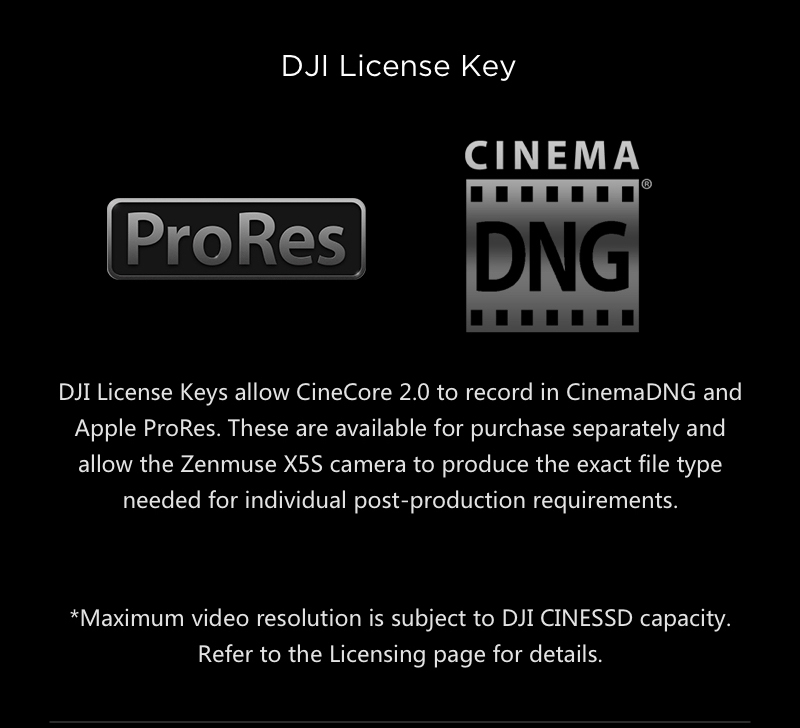 You’ll need a license for Cinema DNG RAW and Apple Pro Res, available through DJI and Commercial Drones, to edit in those formats. What still photo capabilities does the Inspire 2 have? Stills are shot at 20.8MP in a continuous burst rate 14 fps on the X4S, and 20 fps on the X5S. Can video be recorded simultaneously on CINESSD and a microSD card? Yes. Can dual controllers be used? Yes, in a master-slave arrangement. One controller is used by the plot and the other by the videographer or photographer. They can be as far apart as 328 feet. More than one slave — one for a videographer, another for a still photographer — can be used simultaneously. Are range extenders available? Yes. Affordable, professional installation by DroneNerds technicians is recommended. Why is the Inspire 2 considered so reliable? Key components are backed up, so if one fails, the other takes over. The signal is driven by a PWM (pulse-width modulation) signal, which switches to a serial port if PWM is lost. 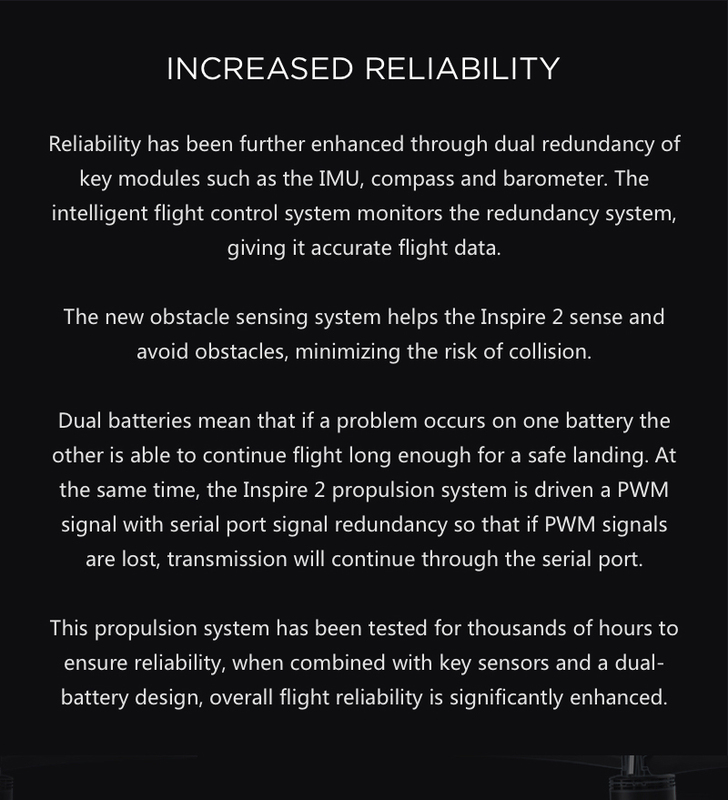 If an Intelligent Flight Battery fails, the remaining battery will get your Inspire 2 home safely. Obstacle sensors are installed in pairs, so one sensor in a pair can back up the other. Dual IMUs and dual barometers overcome failures to ensure precise positioning. Can I get 360-degree pan shots with the Inspire 2? Yes, even though the camera and gimbal do not pan 360 degrees. A program called QuickSpin rotates the entire drone when the camera and gimbal reach a preset stop. It’s seamless. Your video shows a perfect 360-degree pan, even if the pan is done while the drone is moving, with all unwanted shake eliminated by the gimbal. 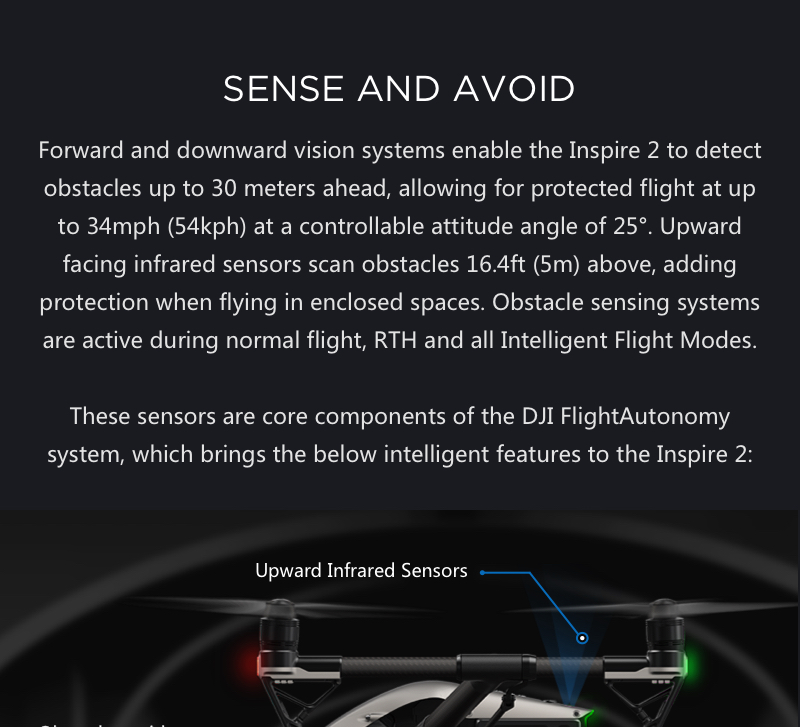 How does Sense and Avoid protect my Inspire 2? Inspire 2 has dual forward and downward sensors that enable it to see obstacles 98 feet ahead while flying up to 34 mph. Upward sensors detect obstacles as far away as 16 feet. Obstacle avoidance works in all flight modes, including piloted control, automatic Return to Home and Intelligent Flight Modes. 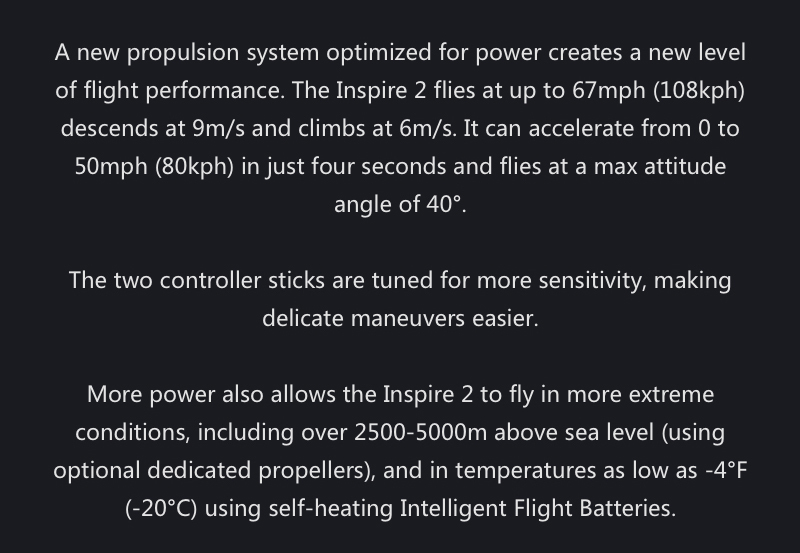 Can I fly Inspire 2 indoors? Yes. Use the three-directional sensors to avoid objects. What is the top speed? 67 miles per hour. 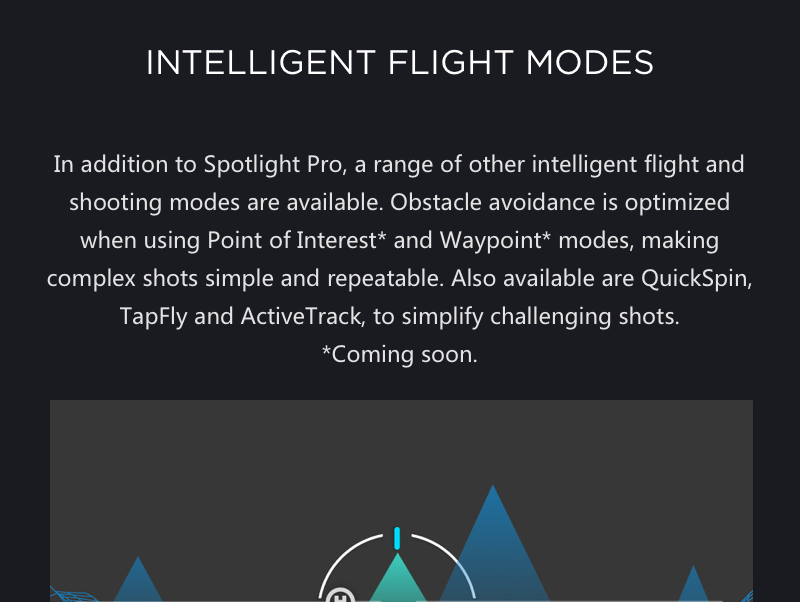 What are Intelligent Flight Modes? 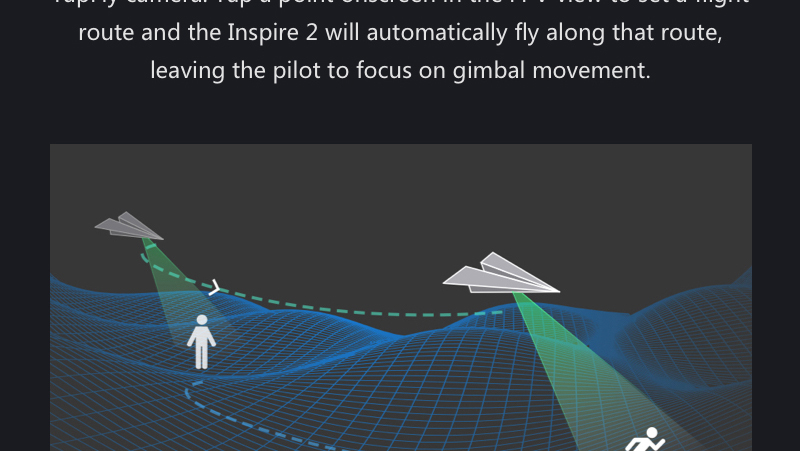 These programmed-in flying controls include Point of Interest, which lets you program in a stopping point, which the drone will circle; Waypoint, which allows you to preplan stops for recording along a route; and TapFly, which allows you to point to a spot on-screen that your drone will automatically, safely locate. Will I have to worry about interference on my video transmission channel? 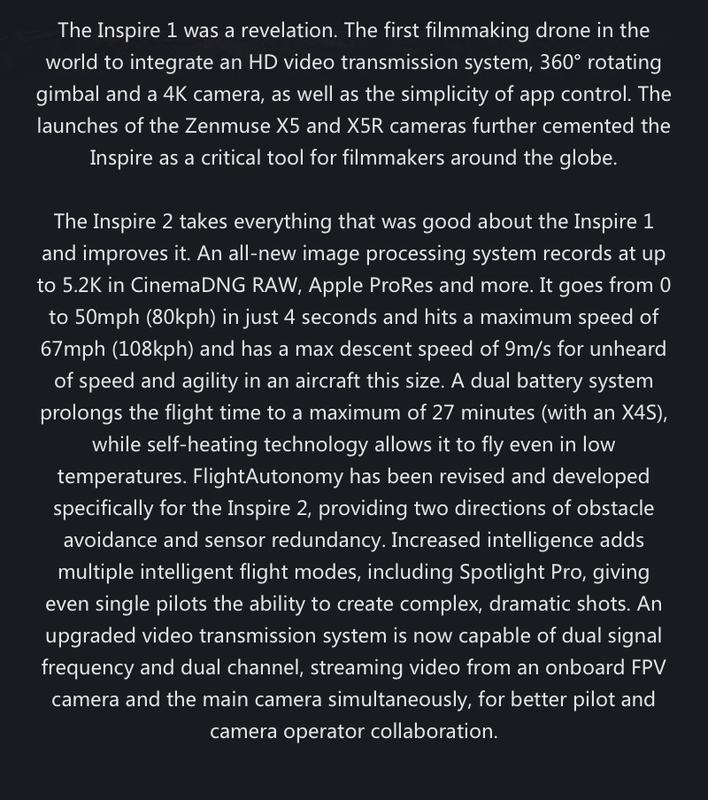 The Inspire 2 uses two frequencies — 2.4Ghz and 5.8Ghz. It automatically shifts between them to find the frequency with the least noise, then uses it so that your video transmission is clear. Can Inspire 2 broadcast video live to TV? Simply connect your remote controller to a satellite hookup and the video transmission will be beamed wherever you want. What materials are used on the quad? The body is a magnesium-aluminum alloy. The arms are carbon fiber. Both materials are strong and light, and they are aesthetically pleasing. Why won’t my Inspire 1 cameras work on the Inspire 2? The Inspire 2 mounts the CineCore 2 processing system on the quad itself, rather than in the camera, as on the Inspire 1 cameras. CineCore 2 works with any compatible camera that’s mounted on the Inspire 2. Can I shoot in and edit with DNG RAW and Apple ProRes? Only if you buy the licenses, which are available individually or together, both through DroneNerds. Is remote focus available? 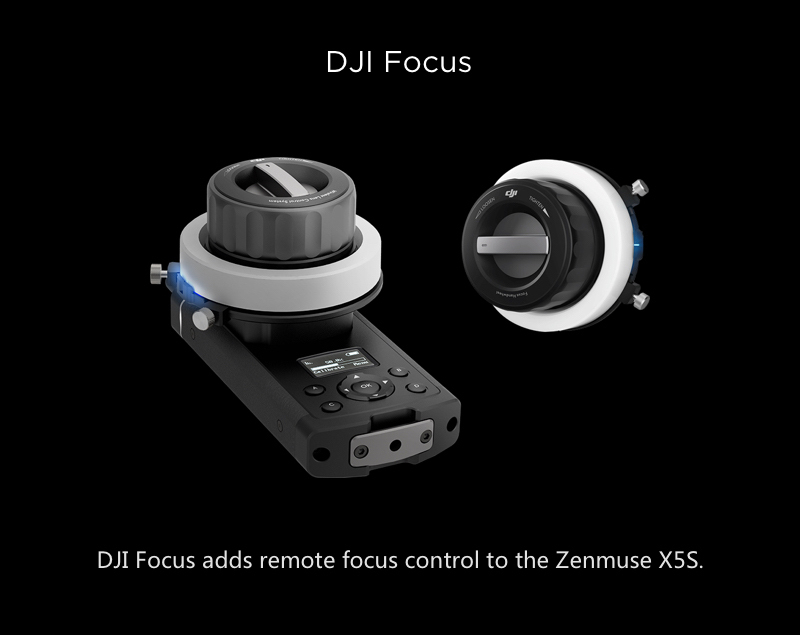 The available DJI Focus is fully compatible with the X5S. My smartphone and tablet aren’t very bright in sunlight. Are there alternatives? 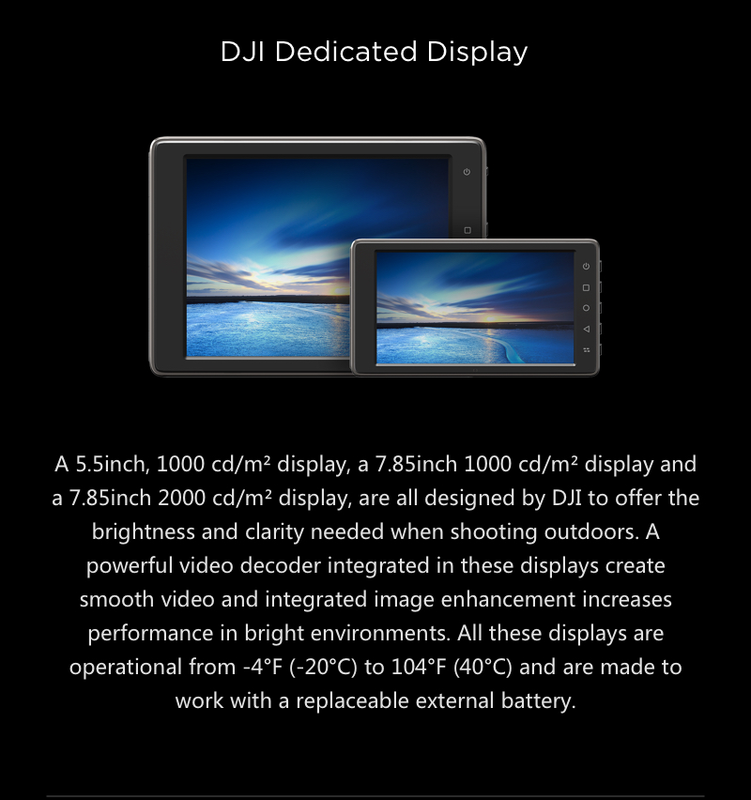 You can opt for available 5.5- or 7.85-inch dedicated displays, which are brighter for easier outdoor shooting.